In the next instalment of the "Nessie on Land" series, I would like to examine a not so well known story. In the course of emails between like minded Nessie people, I was reminded of this land sighting from 1934 which, like most such cases today, tends to move beneath the radar of modern Internet surfers. My fellow Nessie enthusiast pointed out that the provenance of the original story was the March 3rd 1934 edition of the Glasgow Herald which by a stroke of luck I was able to access and reproduce for your interest below. It is a fascinating story and all the more since the beast was so near to the witnesses. I am trying to think of a sighting that was so close in proximity to the observers but for now such an answer eludes me. A further bit of research also produced the following clipping from the Northern Chronicle of the 7th March. The details are largely the same though the distance is given as 20 yards instead of 20 feet. Newspaper reporters are not always the best at transmitting such "minor" details (as I have found in recent reports) and somebody got "feet" confused with "yards" or vice versa but it does add the detail that the sighting occurred about 8pm. Land sightings are important for two reasons. First, the observer is normally closer to the creature than someone who is obliged to watch the animal far out on the loch surface. Secondly, you see a lot more of Nessie since she is out of the water. This apart from revealing more about morphology and behaviour also decreases the chances that the witnesses have misidentified what they are seeing. In the case of Jean MacDonald and Patricia Harvey, they saw just about everything from twenty feet/yards (albeit it was a full moon evening). The date of the sighting is most likely Tuesday January the 30th 1934 based on full moon data for that time which is about the stated four weeks prior to the article being submitted to the newspaper. Given that a full moon rises in the east like the sun and is south at about midnight then I would speculate that at about their time in the evening it was south east and so it is likely the creature was between them and the full moon. Given that the trees in the picture (more below) look deciduous they would have been devoid of foliage in January hence allowing a good deal more moonlight to shine on the creature and as the account says at twenty feet "they had no difficulty in recognising that it was something out of the ordinary". Now seventy eight years since the event, we can employ modern tools such as Google StreetView to find the locality of the sighting. The newspaper account is quite precise in placing the event near where the Inchnacardoch Burn flows under the A82 (The main Glasgow to Inverness road). This places us about the centre of the circle on the satellite map below. At the bottom of the picture you can see the double entrance of the River Oich and the Caledonian Canal into Loch Ness. It is also stated as happening less than a mile from Fort Augustus and the pictures below are about 0.7 miles from the town. Using StreetView we can zoom into the very location of this most unusual sighting of the monster (click on images for detailed views). As we try to place ourselves in the shoes of those two frightened girls, it is clear that twenty feet is a good estimate for the distance between them and the creature (you can also fit in 20 yards as the creature moved further away). As it appeared to them near the river and road intersection, it would have been at its closest and I suggest more of its front was visible. As it made rapid progress, it would have presented a side view to the witnesses and as the beast veered away into the trees, the tail section would have been all they saw. In due time, the monster would have been lost to view in the trees but I suspect our frightened witnesses did not wait until it was out of view as they ran back into town! There is no drawing that accompanies this sighting but based on the description, one can come up with something which I use further below. Now those who are sceptical about this sighting may zoom in one feature to the exclusion of all others - the white underside of the neck. This would suggest an otter. Such is the opinion of sceptic Steuart Campbell who for some reason thinks the description bears a close resemblance to an otter. Maurice Burton is silent on the case but given his predilection for otter explanations, it would not surprise me if he went along with that. Ronald Binns says nothing but Roy Mackal is curious in that instead of accepting this case as positive evidence, he suggests that the witnesses saw a cow or deer. Why he should have thought that I have no idea but the description again bears no resemblance to either animal - even if it wasn't daylight conditions. Otters have been linked with the Loch Ness Monster since the Spicer sighting of July 1933. 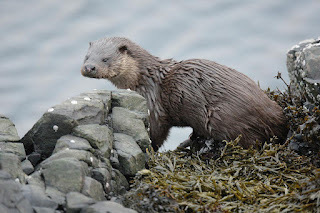 When George Spicer wrote into the Inverness Courier with his account (it was only the second sighting that the Courier had published) the editor preceded it with a local expert's opinion that it was merely an otter with her young. Since then the two animals have been inextricably linked in the monster debate. Some otters do have a patch of white on their necks and for some this is enough to prematurely close the book on this case. Here is one such picture of an otter sporting a somewhat dirty white patch (original link here). 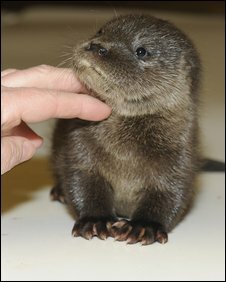 Here is another of an otter cub - I just happened to like this cute picture (original link here). 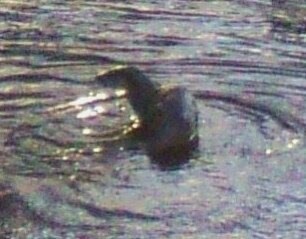 I was keen in this situation to find a picture of not just any old otter but one that was found near Loch Ness. 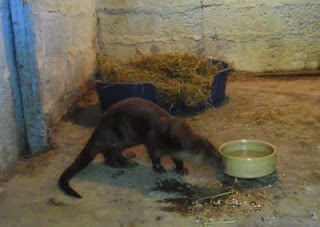 Some are too indistinct to see the underside but I found this picture of an otter rescued in Inverness (original link here). This next one was taken up the road from our sighting in Glenmoriston but it is hard to make out any light coloured underside (original link here). Indeed, getting any kind of photograph of an otter at Loch Ness is a bit of an achievement. "The thickest part of the body appeared to be at the shoulder. The body tapered considerably towards the tail." This description cannot be applied to an otter - white neck or not. In fact, the opposite seems to be the case in that the thickest part of the body is at the rear and so the body rises markedly towards the tail. The contrast could not be clearer. In case it may be protested that the posture is different when the otter is running, check the YouTube video below. I see no difference between standing and running, it's a completely different posture to the creature described. Also, as you can see, an otter when it runs keeps its head down for obvious reasons. When our creature is speeding along, it is evident from the description that the neck was raised. I would also suggest from the account that the creature crossed the burn rather than following its course. Otters tend to follow the presence of water unless forced elsewhere by something like danger. The other important difference is size. 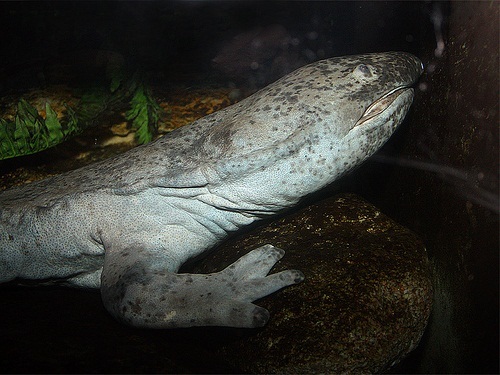 This creature is stated as being up to ten feet long and six feet high. Otters are commonly three to four feet long from nose to tail so we go with three and a half feet for an otter and nine feet for the beast seen by the girls. Height wise, one foot is good for an otter compared to the six feet estimated at Loch Ness. Now one may make a case for size being overestimated (or underestimated) at longer distance, but at twenty feet away, errors of observations are at a minimum (at this point, I have to be fair and point out that Maurice Burton did not discount the possibility that giant outsized otters could live at Loch Ness, other sceptics would point out this is replacing one unknown with another unknown). The two relative sizes of the creatures are shown below. I cut the head-neck short on my reconstructed Nessie since the witnesses did not describe this particular feature. In that light, I could not allow this case to expire merely on the colour of one part of the creature. But now thanks to a combination of a good description of the location, Google StreetView and my attempts at using image editing software, the two respective outlines of the animals can be superimposed on the location to give a sense of what the girls claimed to see against what an otter would look like. I think it is clear that it would be a bit of a push to mistake an otter for something ten foot by six, especially since the witnesses had multiple frames of reference, such as the adjacent trees and the burn being crossed. Put yourself in their place, could you mistake such a creature for something smaller? I don't think I would either. Perhaps it was indeed a large animal such as a deer or cow? Again, put yourself in the place of the witnesses and ask whether an animal familiar to these rural people could be so easily mistaken for this larger creature with a dramatically sloping back at such a short distance. Again, common sense suggests this is not likely. On another point, apart from being the possibly closest sighting of the beast, this sighting may also hold the "record" for the monster being seen furthest from the loch at 350 metres. There is one other sighting which may beat even that, but at such a long distance, what was the creature doing there? That is a matter of sheer speculation. At ten feet long, it could qualify as a "juvenile" Nessie and as such would have less bulk to impede it going further inland. Perhaps juveniles are also a bit more inquisitive? Who knows, but it would seem that the burn which emptied into Loch Ness held the creature's attention for some reason. Whatever the reasons may be for the Loch Ness Monster being found so far from it's lair, two girls wandering back home on an evening stumbled into a surreal situation which would forever be etched in their memories. First of all, let me welcome a new blog to the Nessie blogosphere. The author is Steven Plambeck and it is called "The Loch Ness Giant Salamander". You can click here to visit the blog. You may guess from the blog title that Steven is following in a tradition that stretches right back to the birth of the Nessie story in 1933. Before long neck stories began to dominate peoples' thinking, some held to the view that Nessie was some form of outsized amphibian and in particular the salamander. I am a bit partial to a fish-like amphibian or amphibian-like fish theory myself, so we are in agreement to some degree there. An amphibian has its issues just like any other Nessie theory but I am sure it can hold its own in the Nessie pantheon. However, Steven has had a further look at the Hugh Gray photograph in this respect and is of the mind that there is more than just one creature in view. I'll say no more and you check it out yourself with his latest article. Charles Paxton gave an enlightening talk on the statistics of Nessie sightings last month and here are some reviews of it. Eyewitness reports of the Loch Ness Monster are the lifeblood and raw data of the phenomenon and any serious study of them is to be welcomed. I hope Charles will publish his final paper on this ongoing work sometime next year. On a similar theme, I would give a heads up to anyone near Edinburgh next week on the 11th September as the founder of Fortean Times, Bob Rickard addresses the Edinburgh Fortean Society on that magazine's history and the Charles Fort legacy. I remember as a teenager before FT went mainstream eagerly awaiting the next issue to drop through the letterbox and immerse myself in the weird world of not just cryptozoology but anything you care to label as beyond the fringe of normal human experience. There was also the wacky art of Hunt Emerson and I even played my part as I sent the editorial team any Fortean like newspaper clippings I came across. Further details of the talk can be found here. This post is a place holder for articles which address the cultural aspects of the Loch Ness Monster. This blog of course covers the main theme of Nessie herself and those who pursue her but a modern day mythology has wrapped itself around the creature as society in its various aspects expresses their various conceptions of the Loch Ness Monster. The old Highlanders mapped their bridled demon onto the mysterious object that ploughed its way thru Loch Ness and modern man is no different in how he processes the beast through various cultural filters of the day. You have the Commercial filter where outlets sell postcards (above), fluffy toys, fridge magnets and badges portraying something ranging from a green monster wearing a tartan bunnet to a more standard looking plesiosaur. You have the Hollywood filter which either portrays Nessie as a gentle giant appealing to family audiences such as in the 2007 "The Water Horse" film or for the less nervous we have the marauding man eater such as in the 2008 film "Loch Ness Terror". All entertaining stuff but not much to do with that thing looking like an upturned boat slowly gliding to a point of submerging. That is also reflected in the literary world where films often take their ideas. Steve Alten's "The Loch" leads a genre of book which stays with the mysterious beast you need to avoid at all costs ranging to titles where things are just generally a bit mysterious and edgy. This is most reflected in the Childrens' filter where we see that the Loch Ness Monster seems to have some magical appeal to kids. There are more books written on Nessie for kids than other audiences and I don't see that trend changing anytime soon. This can range from green Nessies which present the Loch Ness story in a kid-like way to general friendly Nessie stories. By the way, if anyone can guess why Nessie is often presented as a green creature in many cultural references despite being generally described as grey or black, I would be interested in your comment. Clearly, grey/black is not a cheery colour or conducive to entertaining, but why green? Each of these filters or genres presents the Monster in a different way to its intended audience. But like the Kelpie of old, they may bear little resemblance to the underlying reality. Even the more serious books which concentrate on the evidence and seek to avoid "entertaining" are not immune to cultural influences as more popular theories such as the plesiosaur one infiltrate the handling of the evidence. In the end, culture is the sum of all our preferences and prejudices and the Loch Ness Monster is no more immune to that than any other folklore, be it modern or ancient. Below are links to the various articles I have written relating to the Culture of Nessie.